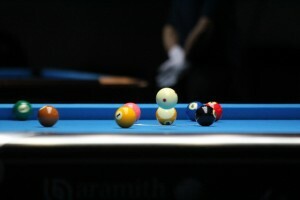 Note to news outlets: photo of the break balls is courtesy of QBSF. Photo of Daryl Peach is courtesy of Takayama Takao/onthehill.jp. Photos of Thorsten Hohmann and Salah Al Rimawi from Richard Walker. Please credit the photographer and “World Pool-Billiard Association.” Thank you–Ted L.
Relief and pure joy were two emotions on wide display on Day 3 of the 2013 World 9-ball Championship, as 32 players booked their spots into Wednesday’s Final 64, the single elimination knockout phase that signals the real start of pool’s most prestigious event. Relief came from those top players who just wanted to notch their second win and put the madness that can be the group stages behind them. Pure joy came from the other players, those that know that winning this tournament is a massive long shot, and just getting through to the big dance is a career defining moment in itself. The 128 player field that began here on Saturday was already considered by many to be the strongest ever gathered for this event. As the wannabes wither and the main stage starts to take shape, the remaining field promises to offer a brilliant collection of cue artists from all corners of the globe. It’s the kind of shot in the arm the sport of pool needs. Today’s play inside the Al Arabi Sports Club in Doha was given over to only winners’ side matches. Winners advanced to the Final 64, while losers were sent over to the losers side of their group brackets, where they will play for one more chance tomorrow on Judgement Day. 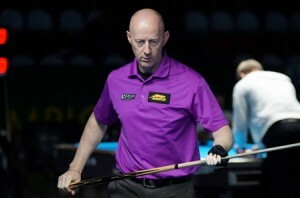 (Doha, Qatar)–As the long, slow grind of this week-long World 9-ball championship wound its way through Day 2, perhaps the best way to try and understand where it’s all headed at this point is to listen to the words of defending champion Darren Appleton, after he won his opening match on Day 1. Add that simple equation together and you’ve got 50 top pros who can wreak massive havoc out on the blue pitch, with 30 who can realistically even consider entering the winner’s circle come September 13th. I don’t know about you. But those look like some extremely impressive numbers that, when added together, can only mean this event is primed for some big time fireworks in the coming days. That’s a guarantee. 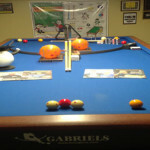 This tantalizing fact has become even more evident after four sessions over nine hours today inside the frigid Al Arabi Sports Club in Doha, as Day 2’s storyline followed Day 1 with those massive upsets we all love again non-existent, and all of pool’s top guns notching impressive wins to position themselves for slots in the Final 64. You need two wins to advance out of the group stage into the single elimination knockout round of 64, and it’s looking like most of the 50 players that Appleton referred to will be there when the real action begins. We’re still in the double elimination group stages for another two days, but 32 players got their walking papers today and saw their dreams of pool glory, however slim, quickly die off until another year. The day began, however, with one final session in the first round with players competing in their first matches. With 14 entries in this year’s field, the most of any country, many fans—especially the legions of Filipino overseas workers who make up a sizeable chunk of Qatar’s 1.5 million population– fancy a Filipino to lift the trophy on Friday evening. And if you were looking for two solid bets, you simply couldn’t do better than Lee Vann Corteza and Dennis Orcollo, both of whom waltzed over their overmatched opponents today with 9-1 wins. Between them Corteza and Orcollo have set a blistering pace this year on the worldwide pool circuit and both are clearly in some of the best pool playing shape of their already impressive careers. In May Corteza won the China Open, which is one of pool’s majors. In June he took the Southern Classic in Mississippi, USA. He then went to Tokyo and placed 2nd in the Japan Open in July. From there he flew to the US where he placed third in the US Open 10-ball. “I’ve been playing well for the last few months,” the notoriously understated and humble Corteza said after blitzing Lebanon’s Mohd Ali Berjawi . The only downside he could think of was that he was a bit tired of all the traveling. But knowing Corteza, that’s simply his non-boastful side coming out. “My game is in good shape,” he admitted with a shy smile. Orcollo has racked up a series of smaller events in the US this year, but they were all well attended by pool’s top pros and the win’s were no less impressive. Both Filipino greats are clearly primed and more than capable. Another veteran whose game has certainly been turned up a notch recently is Great Britain’s Daryl Peach. Peach won the world title in 2007 in Manila. He’s had a terrific campaign so far this year, winning once on the Euro Tour and once on the GB 9-ball tour in England. Peach didn’t flinch today even though he drew a very difficult opponent in Japanese veteran Satoshi Kawabata. After the two traded the first 8 racks , Peach came back from a brief break outside in the blazing Doha sun and turned up the gas for a solid 9-4 win. Several other top European players moved to the winners side of their group bracket, including Greece’s Nick Ekonomopoulos, Spain’s David Alcaide, Holland’s Niels Feijen, Germany’s Oliver Ortman, and Poland’s Tomasz Kaplan. The winners from the first two days will face each other tomorrow to determine the first qualifiers for the Final 64. From there Day 2 became a mini Judgement Day, as the floor was handed over to the losers side of each group. Winners would get one more chance on Tuesday, while losers would be packing up and heading for the exits. Much to the delight of the Filipino crowds, the legend Efren Reyes rebounded from a sorry performance on the first day with a solid 9 – 4 win over the USA’s Shawn Wilke. Another fancied Filipino Carlo Biado bounced back with a somewhat shaky 9-4 win over Qatar’s game Saleh Ameen. England’s Mark Gray kept hope alive with a 9-7 win over Egypt’s very tough Mohamed Elassal. Also winning was young Brit Phil Burford, Japan Open winner Hijikata Hayato, Taiwan veteran Kuo Po Cheng, the USA’s Corey Duel, and Poland’s Radoslaw Babica. 2003 World 9-ball Champion Thorsten Hohmann found himself on the ropes after a poor performance on day 1, but finally showed his true colors with a well played 9-2 win over Iran’s Mehdi Rasekhi. While the win was surely expected, Hohmann put out notice tonight that he has come to Doha in stroke and ready to compete for the crown. And how can anyone not stand up and pay attention? Hohmann’s recent win in the World Straight pool event in New York, along with several other impressive outings over the last few months, mark him as a real contender this week. Hohmann pointed out that although straight pool and 9-ball are completely different disciplines, his mind and cue stroke have become well-oiled from competing, and winning, against world class competition. Also back on the winning track today was China’s Li Hewen. Li, who was last year’s runner up by just one thin rack, was shocked yesterday by Chile’s Enrique Rojas. Tonight Li very nearly gave away a sure win to Italy’s Bruno Muratore, but prevailed, 9-7, to stay alive another day. In one of the biggest upsets of the day, the UAE’s Salah Al Rimawi handed Austria’s Albin Ouschan, Europe’s current number two ranked player, his walking papers with an impressive 9-6 victory. The 25 year old Rimawi’s win is just another example of the massive strides pool and pool players have taken over the last few years in the Middle East. Rimawi recently finished in the top 32 at the China Open in Shanghai. Last year he made it to the top 16 at the US Open. Rimawi explained that there are several reasons why pool has become a rising sport in the Middle East. Firstly, the sport is being backed by the various rulers and Sheiks in the Gulf region. The players are able to compete in competitions such as the Arab games, the Asian games, the West Arab games, and various large pool tournaments strictly for players in the Gulf area. If a player wins a medal, they will receive upwards of $15,000 back home from the government as a reward. The other reason, Rimawi said, is that the media in the Middle East have been covering pool more and more on TV and in the local papers, fuelling an interest in the sport among the youth. Indeed all of the large Qatar daily papers have been featuring articles about the World 9-ball Championship all week here right next to coverage of football. As the young Emirati showed tonight, they’ve already got plenty of game. Play in the group stages continues at 12pm local time(GMT +3) on Monday with all Winner’s Side matches. The players are divided into 16 groups of 8 players each, playing double elimination. Four players from each group will advance to the Final 64 which becomes a single elimination knockout with race to 11, alternate break. The finals, which will take place on September 13th, will be a race to 13. The winner of the 2013 World 9-ball Championship receives $36,000. The runner up will pocket $18,000. The total prize fund is $250,000. *The World Pool-Billiard Association(WPA) will be on hand in Doha throughout the week bringing you all the drama from the 2013 World 9-ball Championship. WPA Press Officer Ted Lerner will be reporting from the Al Arabi Sports Club with daily articles containing insight, interviews and analysis, as well as photos. Ted will also be manning the WPA Facebook page and Twitter feed and responding to fans queries and comments. Fans can also follow all matches via the WPA live scoring platform. *The 2013World 9-ball will be held in Doha, Qatar from September 2-13,2013 and is sanctioned by the World Pool & Billiard Association(WPA), the world governing body of the sport of pocket billiards. 128 players from across the globe will compete for the biggest prize in Men’s Pool. The 2013 World 9-ball Championship is a WPA ranking event.